After facing resistance near the 2875 level during the first four trading days, the index rose to close at 2893 on Fri. Apr 5 – gaining 2% on a weekly closing basis. It seems just a matter of time before the index rises to a new lifetime high. Daily technical indicators are looking bullish and overbought. MACD is rising above its signal line. RSI looks ready to enter its overbought zone. Slow stochastic is inside its overbought zone. All three EMAs are moving up, and the index is trading above them in a bull market. 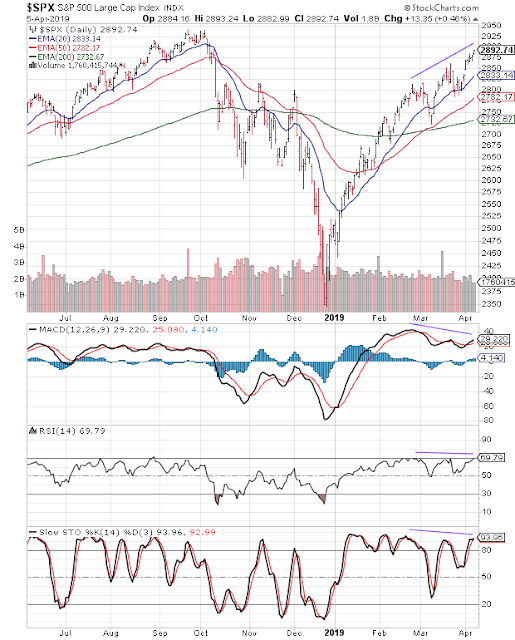 However, negative divergences visible on all three indicators – which failed to rise to new highs with the index – can trigger some correction or consolidation. On longer term weekly chart (not shown), the index closed above its three weekly EMAs in a long-term bull market for the tenth week in a row. Weekly MACD is rising above its signal line bullish zone. RSI is moving up above its 50% level. Slow stochastic remains well inside its overbought zone. 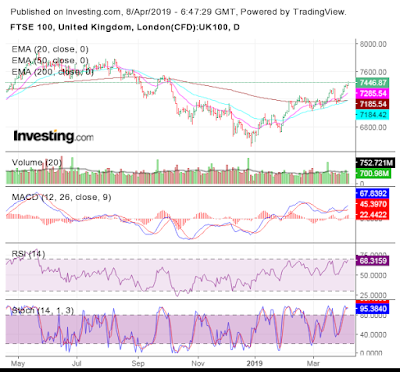 The daily bar chart pattern of FTSE 100 moved convincingly above its three EMAs and touched a high of 7461 on Fri. Apr 5, but closed just below 7450 – with a gain of 2.3% on a weekly closing basis. The 50 day EMA is about to cross above the 200 day EMA – the ‘golden cross’ that will technically confirm a return to a bull market. 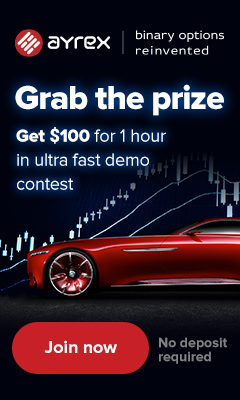 Trading volumes on Thu. and Fri. were below the long-term average. Some correction or consolidation is possible. Daily technical indicators are looking bullish. MACD has crossed above its signal line in bullish zone. RSI is hovering near the edge of its overbought zone. Stochastic is inside its overbought zone. With just 5 days to go until UK is due to leave the EU, Labour Party is hoping for further talks with the government to finalise a BrExit deal. Only a cross-party pact will get the support of a majority of MPs, according to PM May. On longer term weekly chart (not shown), the index closed above its three weekly EMAs in long-term bull territory for the third straight week. Weekly technical indicators are looking bullish. MACD is rising above its signal line and has entered bullish zone. RSI is rising towards its overbought zone. Stochastic is well inside its overbought zone.